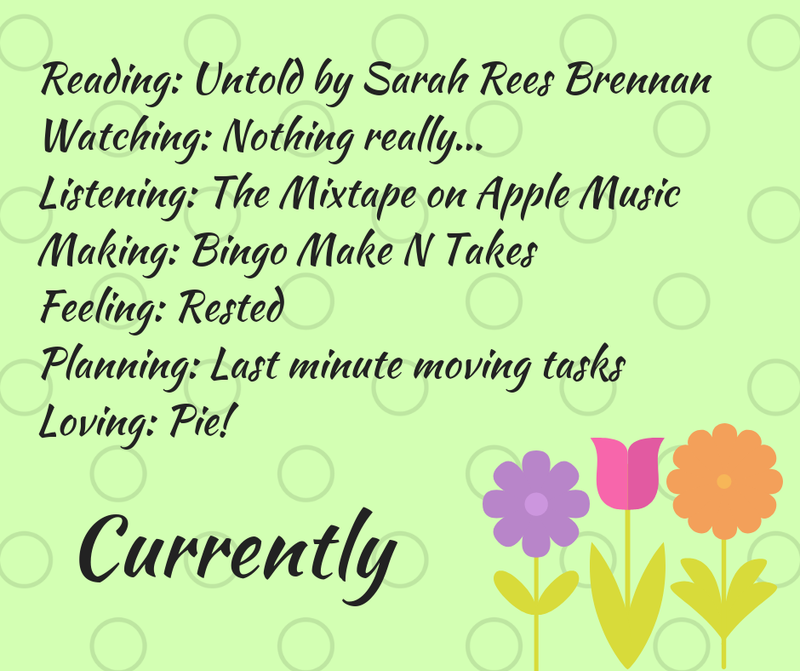 Reading: Continuing the Lynburn Legacy trilogy with Untold by Sarah Rees Brennan. Watching: I was away for the pst few days, so not watching much right now. Listening: All weekend, we were rocking The Mixtape channel on Apple Music. Making: I need to finish the Bingo Make n Takes ahead of Saturday’s event. I have them about 40% done. Feeling: Last weekend’s retreat really did allow me to rest a bit. Feeling decent now. Planning: Our move is just a few weeks away. Trying to get the last minutes tasks listed and accomplished. Loving: Had to stop at the pie place in Guerneville multiple times over the weekend. I got Green Apple Chili, Peanut Butter Chocolate, Pumpkin, and Peach Blueberry Basil. So good!